San Francisco 49ers quarterback Colin Kaepernick has caused quite a stir by refusing to stand for the National Anthem before a recent pre-season NFL game. The reason he gave for this protest is his concern for the way minorities have been oppressed in our country. His actions have been met with a lot of ridicule by patriotic fans. 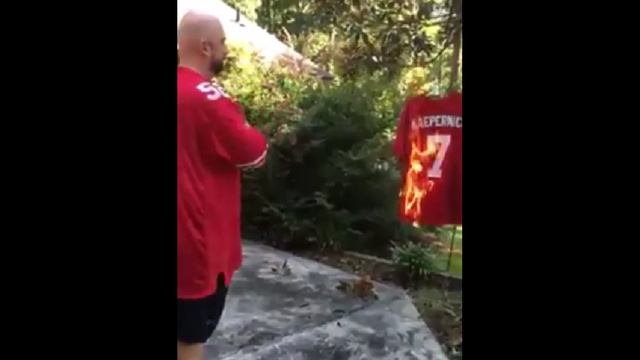 Some of them have burned Kaepernick’s jersey to show their disgust with his protest. Kaepernick has his right to free speech. However, it seems that the path he has chosen will do nothing to alleviate the problem he wants to address. If anything, he has destroyed any platform he might have had to promote any positive change on the issue. We all have certain causes that stir passion within our hearts. Let us be careful about how we take our stand (or our refusal to stand, as the case may be) on any particular issue. We want to be wise in the actions we take to bring about positive change. “Be wise in the way you act toward outsiders: make the most of every opportunity. Let your conversation be always full of grace, seasoned with salt, so that you may know how to answer everyone.”—Colossians 4:5-6. This entry was posted in Christian Living, Culture, Current Events, Sports and tagged Colin Kaepernick, free speech, illustration, patriotism, protest, refusing to stand for National Anthem. Bookmark the permalink.